Up at 7 and out for another walk by 8. A gloomy day with rain predicted. This morning I went through Porlock and headed for the shingle beach. I walked along towards Bossington, passing the lime kilns on the way. The lime was bought to shore by ship and processed before being sent out again. Interestingly the kiln is on a bank and there’s a ditch around it so, apart from the building, it could be an ancient hill-fort that’s not on a hill. There’s also a gun emplacement from WW2 that sits looking out to Wales with an ominous eye. I turned down the lane to Bossington – I’d planned to do a circle back to Porlock – and checked the time. It was only 9! So I thought I’d see how far I could get towards Hurlstone Point. The walk was steep but beautiful. Gorse dotted the slopes and the occasional dog walker moved along higher paths. This is all owned and managed by the National Trust. The coast path branched off towards Minehead but the tower for which I was headed was up a narrow cliff edge path so I went straight on. The higher I climbed, the stronger the wind became. At the very top the path became five steps and as my head cleared the top one, the wind almost blew me off. I leant into the wind as I turned the corner and sat on the bench outside the abandoned coastguard tower. The other side of the tower, the path continued with a scary sign which I had no trouble heeding. As I snapped a quick photo, I glanced up to my right and standing on the precarious slope were a couple of black faced sheep, looking at me with such an air of superiority that I told them about last nights lamb – that shut ’em up. The tower is a very simple affair, though at one time it appears to have had three doors – two of these are now blocked up. There was a fireplace in the main central room which is also blocked up. The floor above is without one – a floor, not a fireplace – and the windows all look out into the bay. The only place out of the ferocious wind was in the tower so I rested for a while here. There was no noise except for the wind and no sign of life – the sheep were outside. I was obviously the only idiot out walking today. I waited for the wind to die down to about 60 knots then carefully picked my way back to the steps and down the trail. It really blew the cobwebs away but was pretty scarifying. On the way back down to Bossington I passed lots of dog walkers and thought what a fantastic place to walk your dog. Incomparable views. It would probably be very crowded in the summer though. From Bossington I strolled into Porlock along a lane. In Porlock I went to the bakery for some yummo bread then popped into the church of St Dubricius. Another Welsh saint (his name is Dyffrig in Welsh), his feast day is 14 November. He was a learned man and scholar who lived in the 6th century. If you believe some people he managed to survive to 120. Yet others claim he was the priest at the wedding of Arthur and Guinevere. According to the movie with Clive Owen and Keira Knightly, Merlin officiated. So, believe who you want. 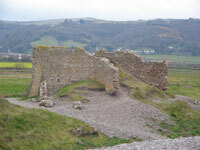 It has been put forward that St Dubricius may have founded the church in Porlock himself. Whether he did or not, the church there now is not the one he would have seen. The current church belongs mostly to the 13th century with reconstruction work from the 15th. It has some lovely monuments. One is supposedly of a crusader (possibly Sir Simon Fitz-Roges). He looks quite small. Another double monument has John 4th Lord Harington and his good lady wife Elizabeth Courtenay, laying peacefully together. Liz has her feet on a rather evil looking creature. Apparently this is the Courtenay Boar which mothers of Porlock use as a sort of local boogieman – “If you don’t behave, the boar will sneak into your room and eat you all up!” Wonder how many permanently damaged children THAT created. Outside the church is the most amazing yew tree. Not sure why it is the way it is but it sure is weird. The rain had started while I was in the church so there was nowt for it but to pop into the Castle Hotel for a quick (read slow) pint of Exmoor Ale. I wrote a postcard and read about the church and tried to wait out the rain. I had no more change for more beer so I went outside and walked back to the house, getting dripped on by the persistent Somerset rain. After a laze around the house which primarily consisted of me having a shower and lamb sandwich, we set off for Arlington Court. This is a National Trust property over the border in Devon. Arlington Court has been around only a short period of time, being started in 1820 and then increased in 1865. But this isn’t why you come to AC. The real reason is the lunatic who used to live there. Now don’t get me wrong, I LOVE lunatics – the madder the better – and the mad Miss Rosalie Chichester is no exception. It is she who bequeathed the house to the National Trust. Why was she mad, you ask. Well, she was a collector. But not an ordinary collector who has stamp albums full of penny blacks. Oh no. Rosalie collected mainly shells and model boats with a bit of bibelots thrown in. And she did it all over the world. She never married and, instead, had a travelling companion, Chrissy Peters who appears as petit as Rosalie was not. Her house is filled with the oddest things. Shells from everywhere, snuff boxes from everywhere, 50 punch spoons???? You’ve gotta love someone this mad. She was also (and this was obviously during her saner moments) a great conservationist. She set up the family estate in order to best please nature. The grounds looked great but it was pouring down with rain. So, like Blenheim before, we went straight to the driest part of the estate, the house. After a tea/coffee of course. The house is very big and airy – though not as big as some. There are ‘things’ everywhere. When the National Trust took over they had to move a lot of her collections out because there just wasn’t enough room for them and visitors as well! She loved yachting so there’s also a lot of paintings of racing boats in full sail. This leads me to wonder whether she is related to Sir Francis Chichester; maybe she was his aunt as she had no siblings. The house as it stands today is definitely the third and possibly the fourth built by the Chichesters on the estate. They had a bit of bad luck with the second house as they hired that well known London architect, John Meadows, to design and supervise the building. Unfortunately he died before completion and the job was finished in a very shoddy manner! 30 years after its construction, it had to be demolished and work started on the present house. Which only goes to show that you really have to keep an eye on these subcontractors or they’ll try and cut corners everywhere. Especially if your architect dies. 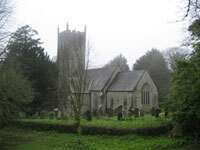 After the house – the rain had let up – we walked over to St James’s church. This is not part of the National Trust but is open. It is a Victorian church (the nave and chancel built in 1846) and houses many of the Chichester family memorials. According to Reverend Henry Ayre (rector of St James’s 1971 – 89), most of the parish records have disappeared so very little is known about the original church. A few memorials remain, including one that is possibly Thomasine Raleigh who married John Chichester in 1384. This pair started the Chichester dynasty in North Devon. The National Trust put a memorial to Rosalie on one of the walls. Not sure if it was out of spite or delight, but they incorporated shells and ferns into the design. Outside the church, I was busy taking photos of things that no-one but me would be interested in and I thought Mirinda said “Watch out for this hole“. After a couple of minutes I turned round and she was gone. Naturally I figured she’d fallen down the hole so I searched. There was no hole. I walked out of the church but there was no sight of her. I decided to walk up to the National Collection of Carriages which is housed in the stables and closes at 4 (it was 4:15) figuring she’d gone up there. No sign of her. I walked back down to the toilets at the main house then wandered lost and lonely until I spotted her returning from the shop. Apparently she’d been waiting in the shop for hours (it was now 4:30) and demanded to know where I’d been. I’d missed all the action. A sheep in a field by the shop had been trying to rouse her lambs by kicking and nuzzling them but it wasn’t working. She increased her shaking and Mirinda and a number of other non-farm people were starting to get a bit hysterical so one of them rushed over to the shop and called for a warden. One was there almost instantly (take note emergency services!) and set about kicking all the reclining lambs, trying to find the dead ones. None of them were dead. As soon as he touched the ones that hadn’t moved they jumped to their feet and gamboled off. And just think, I missed all that. We spent some money at the shop then left, going back via the Exmoor bisecting A396, coming out at Dunster. We arrived home at about 6 and decided to go out for an early dinner. As no restaurant in Porlock opens until 6:30, we first wandered then sat in the Royal Oak for a pint of 6X. Dinner was lovely at the Piggie in the Middle. The waitress hadn’t turned up yet so we were sat by the chef. Had scallops wrapped in bacon (which were nice but the bacon is a bit too strong for the delicate little scallops) and venison (me), duck (Mirinda). All very nice and, of course, no room for dessert. Home quite early so we watched Planet Earth and were in bed quite quickly afterwards. 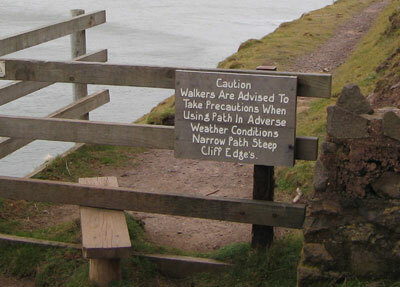 This entry was posted in Exmoor 2006, Gary's Posts, National Trust visits. Bookmark the permalink.